There’s a new version of the IOIO on the way and we think you’re going to like the goals this redesign aims to achieve. If you’re not familiar, the IOIO is an Android accessory board. 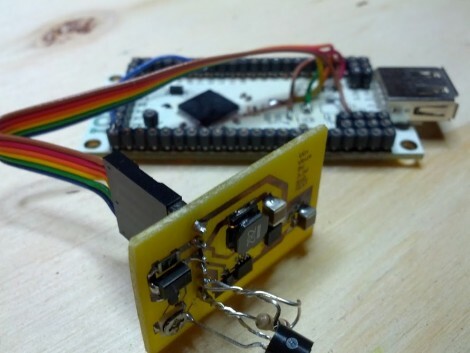 It connects to the phone via USB and is aimed at making it easier to build your own hardware peripherals for the handhelds. Just look around here for a while and you’ll find a bunch of projects that are built around this board (for instance: adding MIDI control to your phone). With [Ytai’s] announcement that the second generation IOIO is in the works he touches on price and functionality improvements. Certainly the $50 cost of the original board is pretty low, but if you’re just planning on hacking for giggles it’s a roadblock. Although no number has been quoted, the plan is to make the new rendition more affordable. As for functionality, the next generation will be a USB On-the-Go device. This means it can be a master when connected to the phone, or a slave when plugged into a computer. There are also a smattering of electrical design improvements.